Welcome to our Belfast Guide! 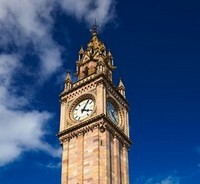 We are happy to welcome you to this Belfast Guide, loaded with information about the beautiful city of Belfast. In this guide you will find tourist information, meaning detailed information, pictures, addresses and useful data about the most famous attractions of Belfast. You will also find information and suggestions for some nice Belfast activities, restaurant recommendations and of course information about good hotels with central location and hopefully some good prices waiting for you! As you read through our Belfast Guide you will find lots of historical information and if you read most of the content of this page you will visit Belfast with lots of knowledge about the city already before arrival, which is a big advantage. If you want to find news about Belfast and information about upcoming concerts and events and other happenings, why not head over to our blog and get the latest news and updates there. We wish you a pleasant stay in Belfast!